For years, Pacific Union College has maintained a medical and dental school acceptance rate well above the national average. The five-year average dental school acceptance rate at PUC is 65 percent, and for medical school this goes up to 68 percent. The national average is around 33 percent. "We've always had a good pre-professional program here," says Dr. Robin Vance, professor of biology and long-time sponsor of the college's pre-professional club. "We have great students, and we've learned how to prep them well." Part of that preparation comes in the form of the student-led pre-professional club. Throughout the year, this club provides opportunities such as mock interviews, presentations by successful pre-professional alumni and doctors from local hospitals and clinics, Q&A sessions with students who have already been accepted to professional school, and more. "It's challenging to be in a pre-professional major," says Shannon Henry, 2017-18 president of the club. "It's hard to balance everything, and we as a club try to offer resources to alleviate some of that stress." When a student expects to continue to medical school, their to-do list before graduation is no small thing. It involves shadowing professionals in the field, applying to around five schools (and paying a large amount for each application), intense interviews, significant testing, volunteering, procuring committee recommendations, and maintaining an impressive GPA, to name a few. "I sponsored this club for almost 15 years," Vance says, "and I've loved watching it grow over the years, as its officers work hard to provide meaningful and significant resources and opportunities for our pre-professional students." Practice runs are par for the course as a pre-professional student. During mock interviews, for example, often science professors serve as the interviewers. This has a twofold benefit: On one hand, the interviews are much less stressful than the real deal will be, as they last only about ten minutes (as opposed to the 45-60 of actual interviews); and on the other hand, it gives the professors, who will be writing the necessary committee recommendations, a chance to get to know the students better. "We use questions that reflect med school interviews," Henry says. "They're not as intense or intimidating because the students know the professor, but the questions help them come up with answers for future interviews." Though there are official pre-professional advisors on campus, many students find an extra benefit in networking with their fellow students through the club. "One of the biggest values of this group is that it allows the students to connect with each other," says Vance. "Students ask each other how they completed certain requirements, what specific classes are like, how they should approach X or Y professor, things like that. Interaction with those who have gone a few steps before are invaluable." And, as many of us know, there's something to be said for hearing from your peers, rather than just accepting at face value what a professor says. "My advice can sometimes fall on deaf ears and yet, the same advice from a fellow pre-professional student is better heard and understood," admits professor Aimee Wyrick, chair of the department of biology and pre-dent advisor. "The student leaders of the pre-professional club make an impact because 1) they have the experience to give sound advice and 2) they provide opportunities to share this information with an audience ready to listen." 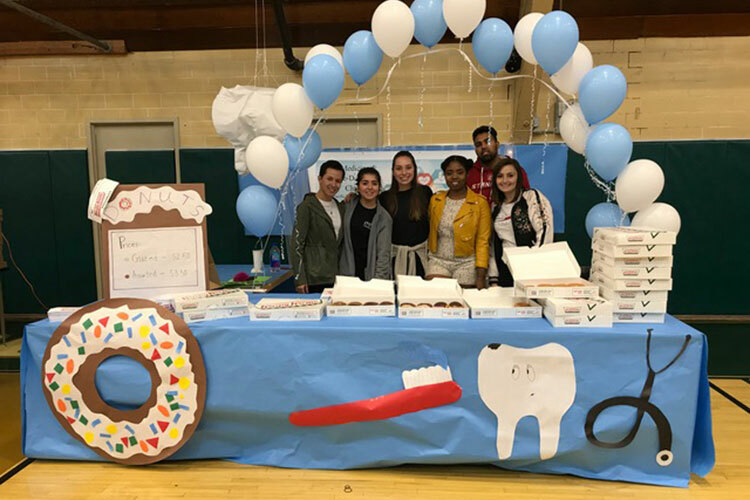 In coordination with the Office of Service, Justice, & Missions, the club arranges for students to shadow and assist doctors and dentists at free volunteer clinics, such as the Amen Clinics in Santa Rosa and Ukiah. Henry graduates in June with a degree in biology, with her sights set on becoming a cardiothoracic surgeon. She has appreciated being part of the pre-professional club, as it gave her access to firsthand insights and information that may have been difficult to find otherwise. Thanks to her involvement with a PUC golf event, Henry met a local cardiothoracic surgeon and was able to shadow him through ICU and post-op. He walked her through what the surgeon's responsibilities are after surgery, and asked her questions to test her knowledge, as well. "How he interacted with the patients inspired me," Henry says. "One lady who was in for her third surgery knew all about the doctor's family and asked about them by name. It was so inspiring to realize how surgeons have such an impact on a patient's life not only through surgery, but also through encouragement and friendship. It was beautiful, and I look forward to experiencing that one day." Recently, PUC students had the opportunity to interact with researchers from University of California-San Francisco. A PUC alumna who is currently researching cancer treatments there gave a campus presentation through the biology department, and this connection will make it possible for UCSF to return to campus regularly and talk to pre-professional students about research options. "You don't have to go straight from undergrad to med school," Henry says. "Two years of research can really boost your application and resume. That's the kind of thing the pre-professional club aims to provide for students." Dr. Kent Davis, chair of the department of chemistry and current sponsor of the pre-professional club, has appreciated Shannon's leadership. "Shannon has been a very creative and well-organized leader," he says. "When I asked whether she had considered this or that, her response was almost always, 'We've already thought about that and it's under control.' I think this role has allowed Shannon's natural leadership abilities to shine, which is really the whole point of student leadership positions in the first place." If you are interested in becoming a member of the pre-professional club next year, contact Dr. Vance at rvance@puc.edu. For more information about pre-professional programs at PUC, visit puc.edu/admissions/academics/pre-professional or email biology@puc.edu or chemistry@puc.edu.